The New York Mets announced yesterday that they would retire Mike Piazza‘s number 31 on July 30, a week after he is inducted into the Baseball Hall of Fame in Cooperstown, N.Y. The game sold out almost immediately. I’m happy for him, and I’m happy for us. In the last six months, we’ve watched our team play in the World Series, we’ve had our second Hall of Famer elected and we’re going to get to see a National League Championship banner rise. Now this. Short of a World Series trophy, I couldn’t have asked for more. If you need new Hall of Famer Mike Piazza‘s autograph, you’ll have an opportunity to get it later this month at MAB Celebrity Services’ “Yankeepalooza” show in Fort Lee. But you’d better have deep pockets. Piazza’s autograph tickets start at $179, plus an additional $59 fee if you want him to add “HOF 2016” or any other inscription to his signature. That’s a little bit too steep for me – the rising autograph fees are one of the main reasons I’ve stopped posting about which former and current Mets are scheduled to appear at collectibles shows each month. Yankee fans may be interested to see that Joe Girardi ($79 and up) and Luis Severino ($65 and up) have recently been added to the show lineup, too. Last night, the Baseball Hall of Fame announced that Ken Griffey Jr. and Mike Piazza would be inducted this summer as the Class of 2016. It took four years, but Piazza finally crossed the 75 percent threshold in this year’s election. And while I can’t figure out how a man who’s been retired from baseball since 2007 managed to do anything that “made him a Hall of Famer” since the last election, I’d rather celebrate the voters getting something right. The Baseball Writers Association of America elected four new members to baseball’s Hall of Fame this year, including one former New York Met. While Pedro Martinez will be remembered by most for his achievements with the Boston Red Sox, my strongest memory comes from one of about a dozen games I went to at Shea Stadium in 2005. While we were settling in to watch the start of the game, Pedro quickly retired the first two Arizona Diamondbacks batters. Then, with Luis Gonzalez at the plate, all of the sprinklers on the infield suddenly turned on! Many pitchers would have let something like that throw them off of their routine. Not Pedro. On the Diamondvision board, you could see Pedro smiling and laughing about the ridiculous situation. While the other players left the field during the delay, Pedro stayed out there. Once order was restored, he struck out Gonzalez and went on to pitch eight innings of one-run ball as the Mets won 6-1. I hope the Mets invite Pedro Martinez out to Citi Field sometime this summer to honor him and give fans one more chance to applaud. I haven’t written anything here in almost a month. Partly that’s due to having less free time to write – I took a seasonal job at a department store so I’d have some money coming in during the holidays. Partly it’s due to not having much to write about – while John Mayberry Jr. may turn out to be an important part of the Mets’ bench, I don’t really have much to say about him. 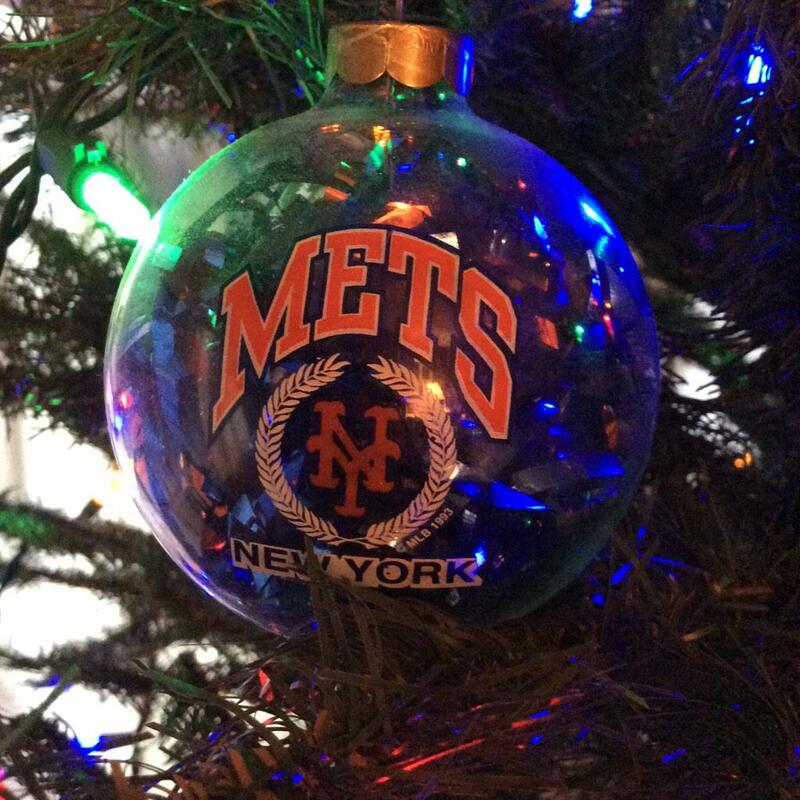 And Mayberry’s been the most interesting addition to the Mets’ roster since the early signing of Michael Cuddyer. At some point, I’ll probably want to talk about the moves that the Marlins, Braves and Phillies have been making this winter… but that can wait until we get closer to spring training. Until today, I hadn’t added many new baseball cards to my collection in the last month. But when I got home from work today, I found a surprise envelope from Geof, who occasionally sends interesting packages my way. I opened it to find a Mets yearbook from 1972, an issue of Time magazine from 1986 with a young Doc Gooden on the cover, some vintage Topps baseball coins, and an assortment of oddball baseball cards. They are all awesome, but I’m going to save most of them for another time. 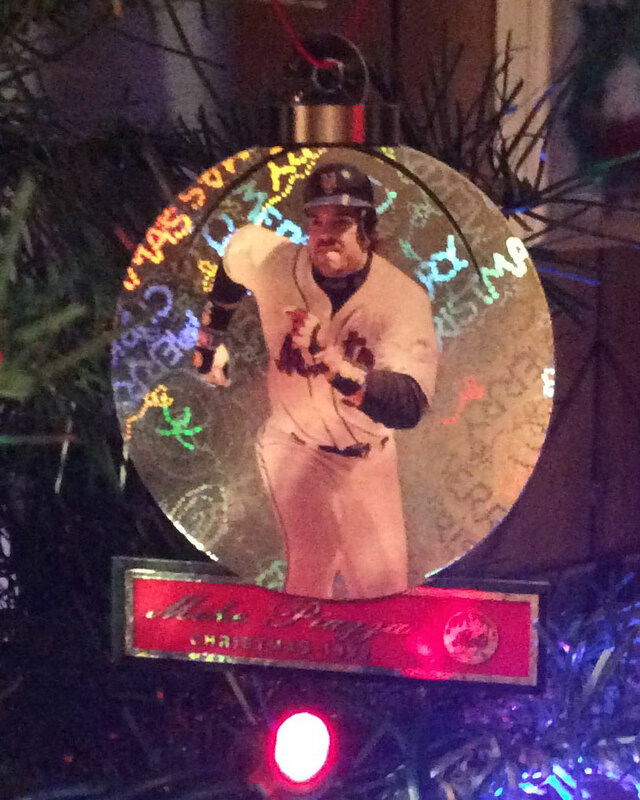 But this is the perfect time to feature one, a Mike Piazza card that went right on our Christmas tree. Pacific certainly did produce some interesting baseball cards, once upon a time. 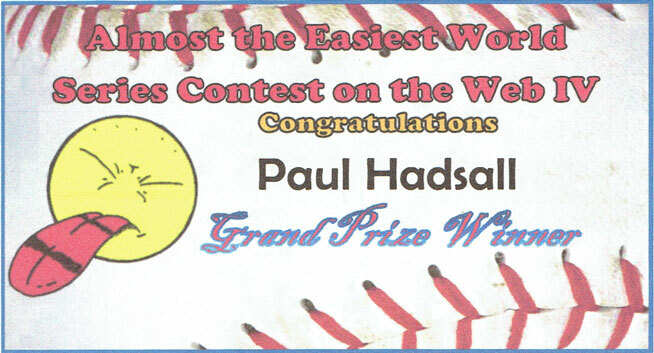 My prize arrived yesterday, complete with a certificate recognizing me as the grand prize winner.